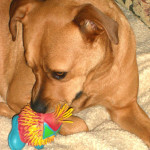 Browsing articles tagged with " mai tai"
Angel is a pit bull and (we think) Rhodesian ridgeback mix who absolutely adores squeaky toys. As sweet as she is, she’s no wilting wallflower of a dog. She’s a rough, tough tomboy who will rip almost every toy to shreds in a matter of minutes. About five winters ago Angel found a toy buried in the snow at the dog park. She was over-joyed with her treasure and, as no-one else was around to lay claim to it, brought the toy home. We called Angel’s plaything Itt, in honor of Uncle Itt from the old Addams Family TV show and Itt has been Angel’s favorite toy ever since. She is incredibly gentle with Itt and extremely protective. When she’s not loving Itt we keep him on the mantle where no-one else can reach him and risk destroying him. 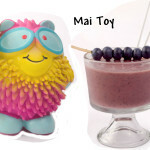 Anyway, I’m telling you this because Angel and Itt were the inspiration for the Mai Toy dogtail recipe in The BARKtender’s Guide, which I’m sharing with you here. I used a stand-in for Itt in the book. Not only is Itt looking rather ragged these days, but I just wasn’t sure whether Angel would be happy about her precious possession being used as a glamour model of sorts.